Doesn't this picture remind you of being a kid and having no responsibilities beyond meeting your friends outside to play? Well times have changed for most of us, but here's to making the best of it! yes, it does remind me of a time when I didn't have to worry about work, bills, LIFE. When the biggest stress was making sure I was home by the time the street lights came on. those were the days. And those were the days when "sneakers" or "tennis shoes" were plain, simple and not bank-busters. Pamela-Funny thing was at the time we thought making it home on time was a big problem! If we only knew then what we know now! 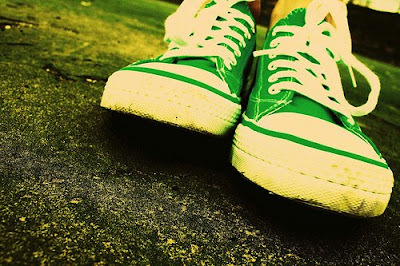 Intense Guy-My favorite sneakers are still Converse. They are the only ones I ever buy.